When I moved to the new place a few months ago, I adopted a stray cat and named her "Floozie". Not that she is one, I really just like that name. I actually used that as a character name when I was still into online gaming. A shocking revelation? But let's not get into that. It was too long ago since I played. 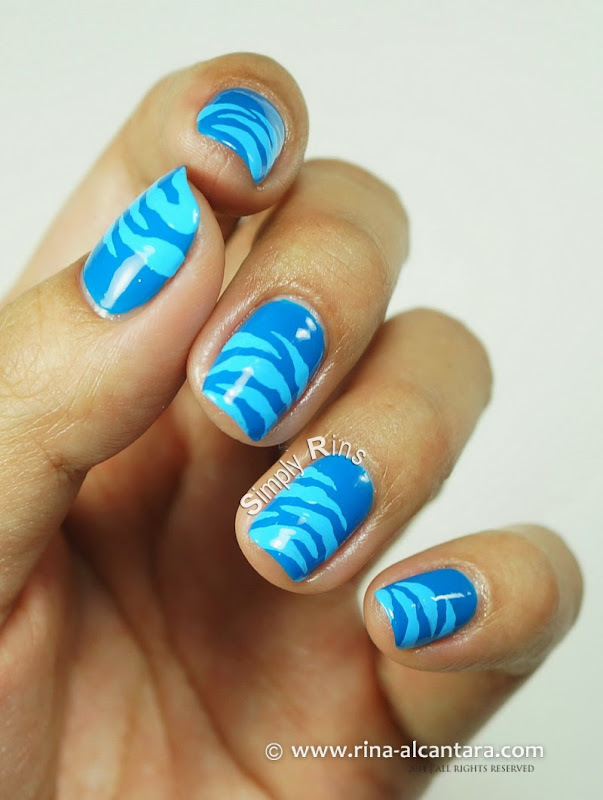 This post is about how my feline friend inspired this freehand nail art. It is my first time to have a cat as a pet. We always had a dog. And Floozie wasn't a domesticated cat when she came into my life (or house). I didn't know much about cats. So during the times I tried to bath, cuddle, or play with her, I sometimes get scratched. I have a lot on my legs and arms. Thankfully, she is more at peace with me now and I have less and less scratches. There is however, an irony. Floozie is a girl and I made a blue nail art. Sorry. I have no excuse but my absentmindedness when I was painting my digits. Remind me next time to double check my ideas before I paint them on my nails. I used 2 coats of Deborah Lippmann Video Killed the Radio Star as base color, acrylic paints and a detail nail art brush for hand-painting the design. 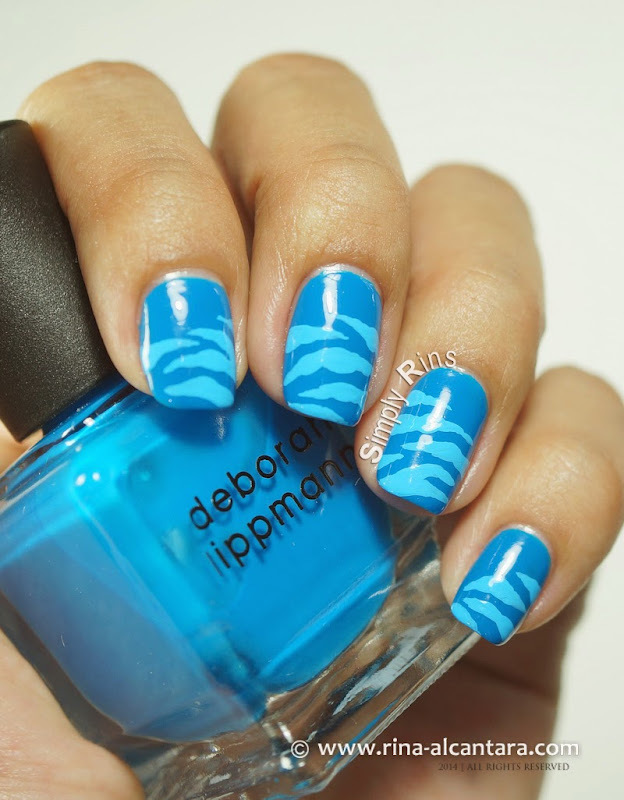 This nail art is quite easy to do even for beginners because it doesn't require a lot of brush stroke accuracy. The idea was to paint "scratches" on my nails. It is basically very similar to a tiger print. And instead of filling the entire nail with scratches, I opted to just paint a few near the free edge. I also initially wanted to paint the nail design with white but changed my mind the last minute to a lighter shade of the polish base for an ombre look. Overall, the nail art looks attractive and I enjoyed wearing it. My friend who was in Manila recently said that it looked like the ocean and it does actually, right? It's fascinating how other people see and interprets nail art differently from how the nail artist conceived it. As a nail artist, I know that most of my designs that I share in this blog has a personal story attached to them. And I think that what makes many nail art bloggers stand out, for me at least. I'd like to look at a nail art design and wonder what's the story behind it. Where did the inspiration came from? Somehow the nail art gives a glimpse of the nail artist's life. Well, I hope you like this Blue Scratches nail art I did in honor of my cat, Floozie. I hope she'll never leave a scratch on me again.